There’s precisely one stressful thing about Rancho Pacifico, and that’s the two-mile drive, 2,000 vertical feet up a mountainside, from the little town of Uvita on Costa Rica’s southern coast. For the Indiana Jones types who insist on driving themselves, the hotel offers a set of directions that begins with the phrase “Just after the highway ends” and concludes with remarkably specific advice regarding which gears to engage and when. The payoff? 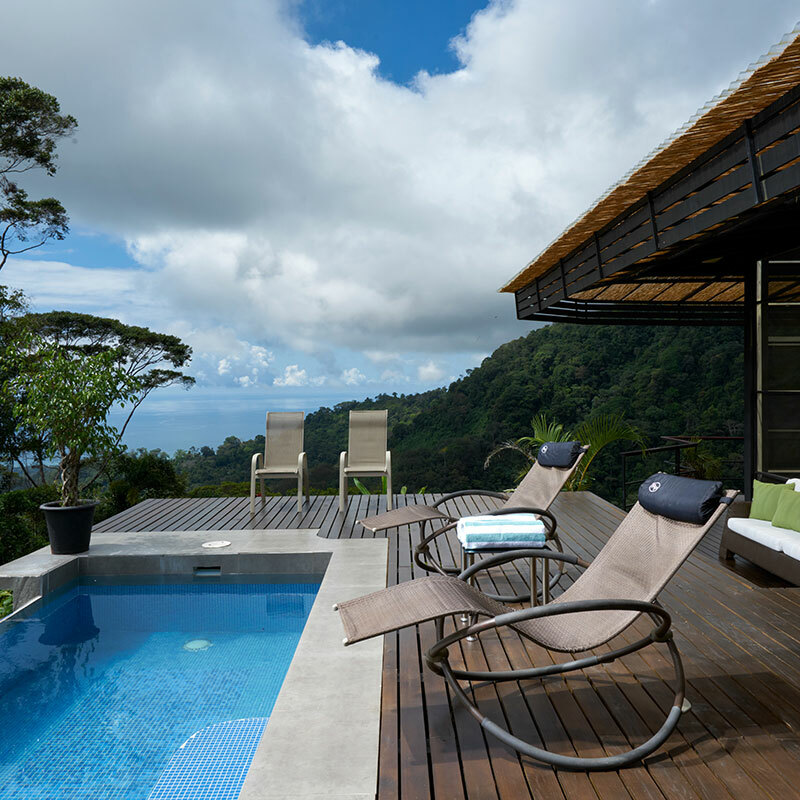 250 private mountainside acres of virgin rainforest with an embarrassment of ocean views, flora, fauna and pristine waterfalls, all shared by a maximum of twenty guests. 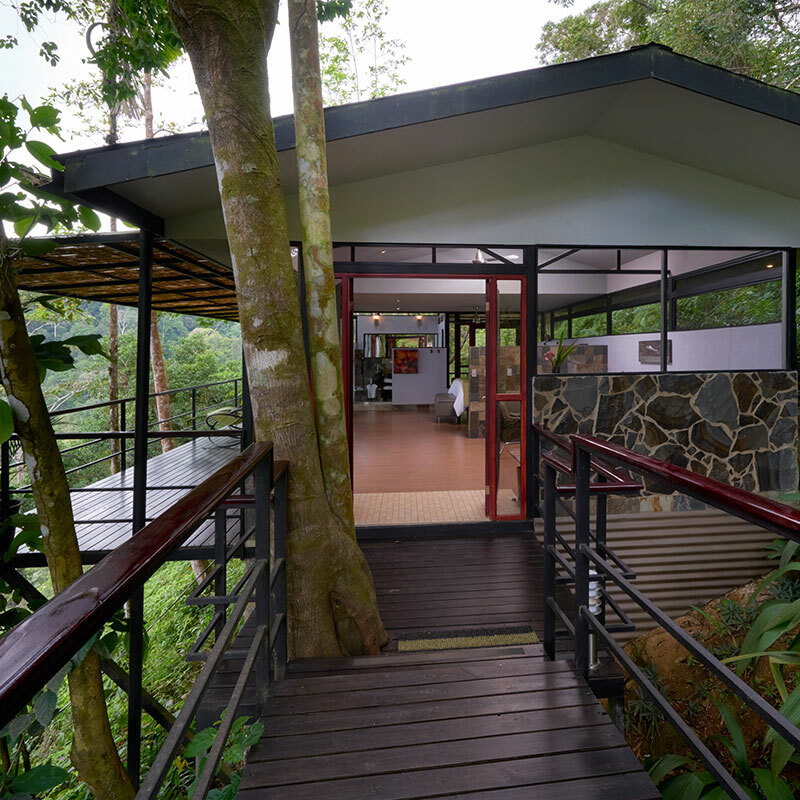 It turns out that 2,000 feet is a goldilocks zone in this part of the world — high enough above sea level to make for pleasantly cool, mosquito-free nights, but not so high that you’re in the dripping-wet cloud forest. This means you can frequently leave the windows open and the AC off, listening instead to the sound of a nearby waterfall and monkeys hopping through the canopy. Here on the little-developed Costa Ballena you might expect the lodgings to stay fairly rustic, but — well, you see where this is going: private gardens and decks standard in every room, oversized showers (some of them outdoors), natural stone countertops and bamboo curtains, tasteful contemporary furnishings, original art, a spa with a tree-top treatment area and spring-fed soaking pools. 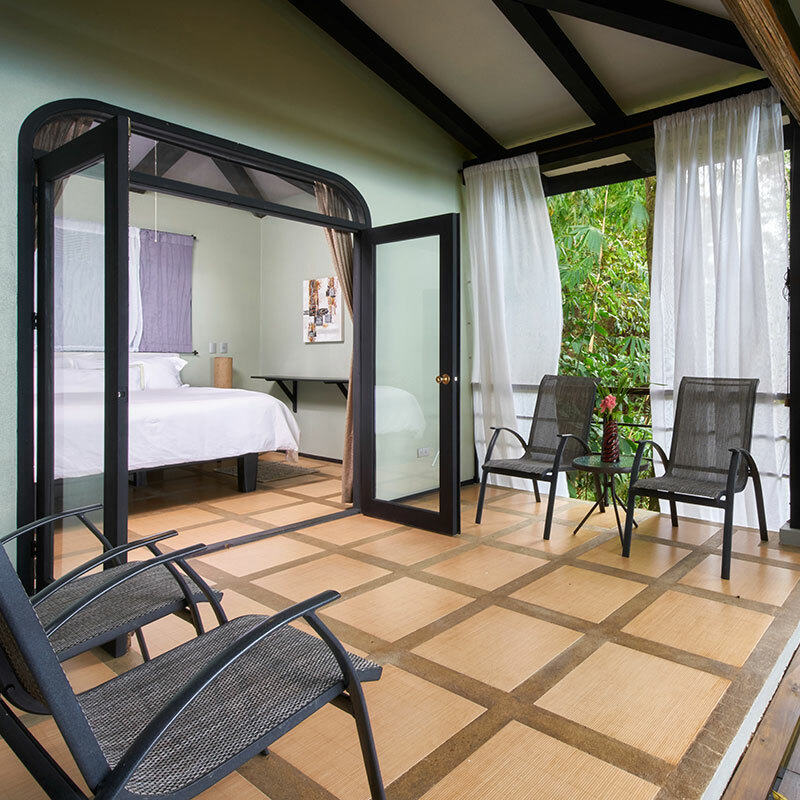 While space, privacy, and views are abundant throughout, the Romantica and Treehaus Hideaway villas bear special mention. 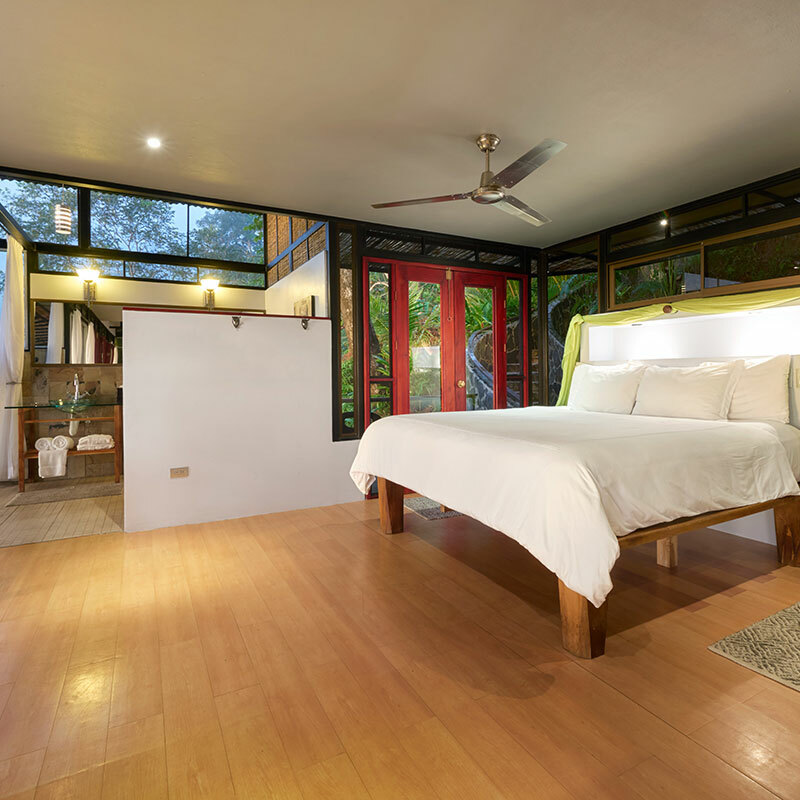 The former, at 1,250 square feet, includes jungle spring–fed showers for two, a private infinity pool, and a full kitchen and bar, while the Treehaus villas, complete with outdoor Jacuzzis and hammocks on their private decks, are built into the jungle canopy, twenty feet above their own three-acre gardens. If you can muster the energy, there are miles of private trails leading, for example, to waterfall-fed swimming holes, or to the cloud forest above, where rainbows are about as abundant as the bromeliads — that is, very abundant. Or head toward the water to explore any number of secluded beaches by foot or on horseback, to take a surf lesson, or to travel by boat in search of dolphins and whales. Then again, perched at just the right height on the mountainside, from the privacy of your deck, you may decide there’s plenty to see without going anywhere. Please note: The hotel only allows guests over the age of 18. How to get there: Rancho Pacifico is located 20 miles (45 min) from the Quepos Airport. Transfers can be arranged for US$85 for up to 4 guests, one way. Please contact CustomerService@TabletHotels.com for assistance with airport transfers.